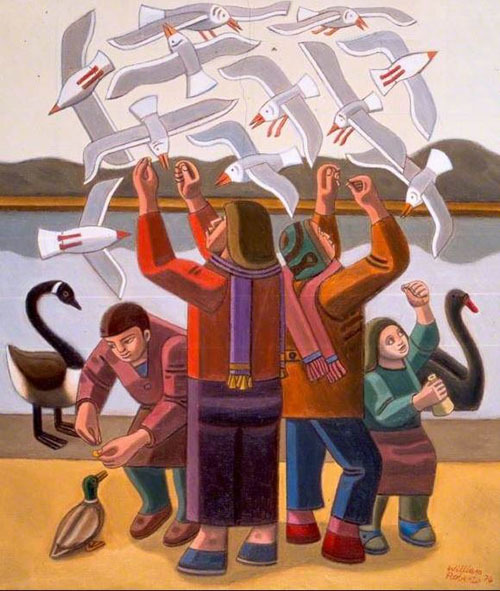 Caption: Feeding the Seagulls by William Roberts, 1974. Signed. Roberts often represented groups of people enjoying themselves. In this late work he has carefully constructed a composition from life-drawings. The resulting painting resembles relief sculpture. Acknowledgements: Purchased with assistance from The Museums and Galleries Commission/The Victoria and Albert Purchase Grant Fund and Reading Foundation for Art.